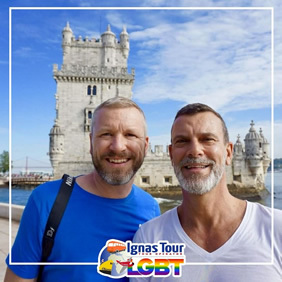 Take an amazing balmy climate, add in an upbeat nightlife, mix that up with a charming outdoor atmosphere, beautiful sandy gay beaches, stunning cultural attractions, narrow winding streets and the friendliness of the Portuguese and you have the perfect ingredients for an international gay destination. Portugal is one of the most tolerant countries around the world. 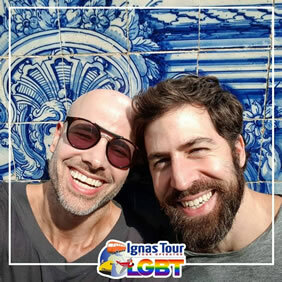 The most organized gay scene of Portugal is located in Lisbon and, more particular, in Bairro Alto region, and the nearby coastal town of Cascais, Porto and the touristic cities of the Algarve region. Explore this special country with us! • Discover Lisbon, the city of the seven hills kissed by the sun reflecting on the river and creating a mirror of beautiful colors. • Let yourself be involved my the mystical Sintra, worth of magical fairy-tales and most beautiful love histories. • Discover Porto and all its history, eat a “francesinha”, enjoy the beautiful Douro River and try the famous Port in a wine cellar. 'Steamy Hot' is the best way to characterize the gay life in Lisbon. Lisbon is definitely not the first city to think of when searching for where to spend your next gay vacations, with London, Paris, and Madrid on the map overshadowing it. However, when we are talking about gay cruising or underground gay scene, well Lisbon does it best. The gay scene of Lisbon is extensive, and a huge part of it is "underground". The nightlife of Lisbon is concentrated on the Bairro Alto area, including the gay street Rua Barroca where you will find the most popular gay bars in Lisbon. Principle Real is another great area with gay bars and clubs, while Alfama, the oldest part of Lisbon, has some excellent traditional entertainment options as well. There are a couple of gay beaches near Lisbon, which are a must-visit during summer months. Beach 19 at Costa da Caparica is the most popular one, where thousands of gay men visit it every summer. Many of the men are actually naked, while there is a lot of action taking place in the bushes. Costa da Caparica is the least popular gay beach, and the southern you go, the fewer people you will meet. A great place to spend your afternoon! Rainbow Tips: Take a deep tour into Lisbon's Gay Nightlife like Príncipe Real area and the old Bairro Alto quarter where you can find a very visible gay life at night. 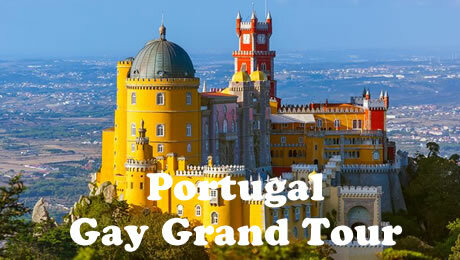 • Buffet Breakfast and enjoy a special day tour of Lisbon with your LGBT Friendly Tour Guide. • Start with the treasured 16th century Belem Tower and the Jeronimos Monastery, the city's most prominent monument, designated a UNESCO World Heritage Site. Today, the monastery serves as a reminder of Portugal's wealth and power during the Age of Discovery. • Then, to the dramatic Monument of Discoveries, built in honor of Henry the Navigator, instrumental in the success of Portuguese explorations during the 15th century. His monument, stands majestically at the marina in Belem, starting point for many of the country’s explorers. • After the tour enjoy the tasting of the worldwide known Pasteis de Nata or de Belém, typical Portuguese sweets. • In the afternoon continue the tour with S. Pedro de Alcântara to enjoy a breathtaking panorama over the S. George Castle and Alfama. 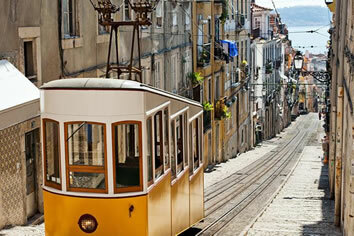 Reach the LGBT Friendly district, Bairro Alto, XVI c. quarter with typical restaurants, and bars. Reach then Chiado district, an elegant and artsy area, beloved by many LGBT poets and writers. Place of theaters, old bookshops and fancy restaurants, you can find a real-sized statue of Fernando Pessoa in A Brasileira, one of Chiado’s century-old cafés. • Take a ride on one of Lisbon’s most iconic lifts, Elevador de Santa Justa one of the city’s most famous sights. Its unique structure and the amazing view from the top, make it one of the city’s busiest tourist attractions. Enjoy the view of Lisbon from the platform. • Finally reach Baixa, the quarter built after the earthquake in 1755, a lively area, the most popular shopping quarter of Lisbon and a district with majestic buildings and consistent architecture. • Buffet Breakfast and departure to the medieval village of Sintra (a UNESCO world heritage site) famous by its mystical hills dotted with fairytale palaces and extravagant villas. • Then start the visit by the enchanted Park and National Palace Of Pena, which is the most complete and notable example of Portuguese architecture in the Romantic period. It stands on one of the rocky peaks of the Serra de Sintra, and blends in a surprisingly fortunate manner with its natural background of greenery and crags. Afterwards visit Quinta da Regaleira. The gardens of the Quinta da Regaleira were styled to represent ancient secret orders, with hidden tunnels and concealed symbolism. • Don’t leave Sintra village without tasting the local gastronomic speciality “queijada” in one of the most ancient and famous pastry shop (not included). • On the way back to Lisbon, we will stop at Cabo da Roca cliff, which is the most westerly point of continental Europe. • We’ll also discover the “Sunny Coast “and its beaches: the cosmopolitan Estoril and the colourful Bay of Cascais. This is both a traditional fishing village and a dynamic resort with bars, nightclubs and good restaurants. • Back to Lisbon and free time. • Overnight at your hotel in Lisbon. • Buffet Breakfast and departure to Azeitão where you will enjoy a special Wine Tour. After crossing the Bridge 25th of April you’ll find the Cellars of JMF where you will taste the delicious Portuguese Wine. • Continue travelling through the beautiful Arrábida Mountains, and arriving in Setúbal, where you can have lunch on your own. • Visit the Fort of St. Philip and then continue towards Palmela to visit Palmela Castle, ending the tour crossing Vasco da Gama Bridge, enjoying the view of the Tagus River. • On the way back, visit 2 cruising areas, Coina and Beach 19 the most famous gay beach in Iberia Peninsula. • Buffet Breakfast and be ready to enjoy a trip to the beautifully preserved and fortified town Óbidos, dating from the Middle Ages. Founded in 208 BC, Óbidos is commonly known in Portugal as the 'wedding present town', as it was a gift from King Dinis to Queen Isabel on their wedding day in 1282. • Free time to explore the village’s medieval fortress, narrow streets, colourful houses and Gothic doorways and windows decorated with flowerpots and dazzling tiles. • Try a «Ginginha", a cherry liqueur, a local and famous speciality. • Continue the tour to Nazaré, the most typical and colourful fishing villages of Portugal. • Visit to the Sítio to have a wonderful view over the town and the beach. • Lunch on your own to taste delicious fish specialities with a fantastic view. • After lunch continue to Coimbra. • Arrival and accommodation. Overnight in Coimbra. 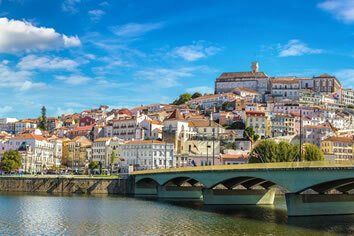 • Buffet Breakfast and enjoy a special LGBT Friendly visit of the city of Coimbra. • The city was the setting for the forbidden love of Dom Pedro I and Dona Inês, a lady at court. Inês was executed at the orders of the king Dom Afonso IV, who saw in this romance the danger of Portugal being submitted to the rule of Castile. An inspiration to poets and writers, their story still forms a major part of the city's rich heritage. • The city is nowadays the center of fine arts and letters. Known for her twisting streets and terraced houses. You’ll have the possibility to visit the 13th-century University (upon availabilty) A centre of learning, par excellence, the University of Coimbra was founded in 1290 and is one of the oldest in Europe, and was classified World heritage site by UNESCO. 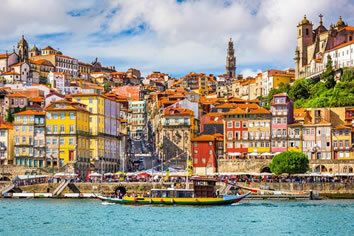 • Then proceed to Porto, the second largest city of the country. Arrival and accommodation. • Dinner on your own. Overnight in Porto. 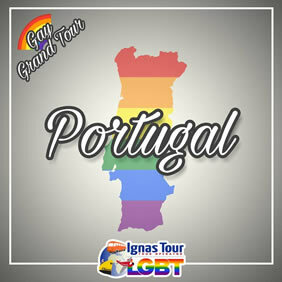 • Buffet Breakfast and admire the precious and picturesque city of Porto with your LGBT Friendly Guide. • With a history stretching back to pre-Roman times, Porto has a dearth of history to explore. It was occupied by the Moors, the heart of Portuguese ship building, and invaded by Napoleon’s forces. Nowadays, Porto is home to many of Portugal’s largest corporations of various industries. The city gave the name not only to the whole country, but also to the famous Port Wine. • Visit to the gothic church of São Francisco (the triumph of baroque ornamentation) and to the Palácio da Bolsa and its famous Arabian Hall. • Lunch on your own in the typical “Zona Ribeira” right next to the Douro River. • In the afternoon enjoy a mini-cruise on the Douro River. • Disembark on the Vila Nova de Gaia side and visit a wine lodge. You’ll be given the opportunity to taste the famous Port wine. • Afterwards free time for individual visits and shopping. We suggest you to visit the famous Lello Bookstore, also known as Livraria Lello & Irmão and Livraria Chardron, famous also for have being frequented by JK Rowling, author of the Harry Potter series, when she taught English in Porto and is reported to be an inspiration for her writing. • In the evening discover Porto's Gay Nightlife, saunas, bars and clubs. Overnight in Porto. • Buffet Breakfast and departure to Braga, the Portuguese Rome, where you can admire of the most outstanding Portuguese architecture: The “Bom Jesus” church and its spectacular stairway. • Free time in the city center. Lunch on your own. • Then, continue to Guimarães, considered the birthplace of Portugal because Afonso Henriques, who went on to be the first king of Portugal, was born here ad therefor is associated with the formation and identity of Portugal, and was classified a World Heritage site based on the originality and authenticity applied in its restoration. The city still has a harmonious, well-preserved heritage that is evident in the graceful iron verandas, granite balconies and porticos, mansions, arches connecting the narrow streets, paving slabs smoothed by time, towers and cloisters. For a moment you might imagine yourself to be in a medieval setting, where the nobility built their houses over time. Visit also the Palace of the Dukes of Bragança. • Back to Porto. Dinner on your own and overnight in Porto. • Breakfast in the hotel and transfer to the Porto airport. The Almirante is located right on Avenida Almirante and next to the Anjo Metro Station, offering easy access around Lisbon. The hotel comes with a bar and lounge area, where guests can enjoy snacks and nonalcoholic beverages. The Almirante Hotel is located a 10-minute drive from Lisbon International Airport. The Marquis of Pombal Square and the Eduardo VII Park are a 20-minute walk from the hotel. All rooms are air-conditioned, have a flat-screen TV with cable channels, safe, mini bar, a kettle for tea and coffee and a modern private bathroom with hairdryer and amenities.. The décor of the rooms varies from floor to floor, as each features a different theme, related to Lisbon and its monuments. Guests can benefit from a 24-hour reception. Guests can enjoy a daily breakfast buffet in the luminous restaurant. It also serves daily meals and snacks. Located in Coimbra, 1.1 km from S. Sebastião Aqueduct, Sapientia Boutique Hotel has accommodations with a terrace. This 4-star hotel offers a 24-hour front desk and a concierge service. The tour desk is available to assist guests in planning their days out. University of Coimbra is 1.4 km from Sapientia Boutique Hotel, while Portugal dos Pequenitos is 2.6 km away. The rooms in the hotel are equipped with a flat-screen TV with cable channels. Rooms are complete with a private bathroom, while some accommodations at Sapientia Boutique Hotel also feature a seating area. Guest rooms feature a closet. A buffet breakfast is available each morning at the accommodation. Guests can enjoy a meal at the on-site restaurant, which serves a variety of Portuguese dishes. Located in Porto Coliseum building, the recently refurbished Porto Coliseum Hotel offers modern themed rooms and a rooftop terrace bar, a few steps from Santa Catarina Street. Free WiFi is included. The closest metro station is Bolhão, located within a 5-minute walk. Porto International Airport is around 11 mi from the hotel. Staff at the 24-hour reception can help guests with local tips and shuttle services. The iconic Bolhão Market is 350 m away from Porto Coliseum Hotel. Aliados Avenue and Clérigos Tower are within a 10-minute walk. Rooms evoke memories from past shows combined with an elegant and contemporary décor. 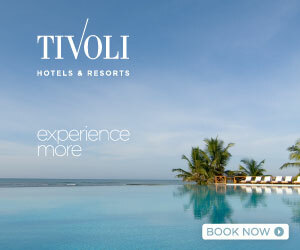 Rooms include air conditioning, a flat-screen cable TV and a mini-bar. Some have a seating area. Breakfast is served daily in the rooftop breakfast room and includes fresh fruit, croissants, eggs and cereals. When the day is sunny, breakfast can be enjoyed outdoors, while gazing at the city. The Lounge Bar Coliseum offers stunning views over the city and provides a nice setting for a sunset drink.